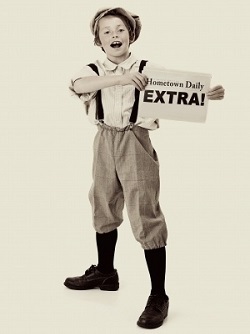 Newspapers have been published in some form ever since the printing press was first born around 600 years ago. Nonetheless, very early U.S. news press was a primitive, time-consuming process that involved performing tedious tasks by hand. Thus, as a practical matter, all print newspapers had 4-page maximum lengths that didn’t change for nearly two centuries when linotype machines emerged in 1886. Consequently, pre-linotype publishers had to strike a delicate balance between featured article length and the level of available advertising space. That naturally left very little room for obituaries, most of which were one-liners. The Modern English-language term “obituary” has lexis roots dating back to Old Latin’s ‘obit’ derivative, which meant ‘death.’ Like total length, specific labels used to denote death-related news publications has also evolved drastically over time. For the first two centuries or so, newspaper obituary and death notice sections were variously titled “Memorial Advertisements”, “Death Acknowledgments”, “Death Announcements”, “In Remembrance”, “Died”, etc. One variable has remained constant, however. Its persistence resides in the historically direct proportionality between relative fame or prestige during life and the length of the recently deceased person’s obituary. Although unjust at first blush, that historical phenomenon imparts a huge advantage to modern genealogy and journalism. Prof. Hume further posited that obituaries provide greater insight into the history of American journalism by illustrating how prevailing news practices evolved with mass press emergence that might have historically influenced death notices. Supporting references cited are Andrew Jackson’s Presidency, the Civil War and early Women’s Suffrage Movement. Per Hume, exclusion and manner of remembrance in newspaper obituaries align perfectly with prevailing values of corresponding U.S. history periods. That theory has solid confirmation from still another credible source called Funeral Information Services. FSI published a column that paints a historical picture of U.S. newspaper obituaries. One section sub-titled “Mood-ometer” states that early pioneers’ death publications highlighted the value of human life, while Civil War vets’ reiterated sentimental and religious values. Then, during the late 1800s, ‘Death Journalism’ dominated newspaper obituaries with morbid tidbits about how the deceased person met their end. Next, during turn of the 20th Century, obituaries were written as poems. Finally, by the late 20th-Century, Democracy came to rule newspaper death publishing with the rising of a ‘common man’ concept that recognized regular dead folks as equal to recently deceased rich aristocrats. Not long after, the Common Man received a total remake, courtesy of the New York Times ‘Portraits of Grief’ series. Published in 2011, the Series features a selection of 200-word obituaries that were later consolidated for re-publication in print book form that chronicled each lost life at Ground Zero. Nowadays, virtual venues reign America’s newspaper obituaries. As the U.S. public and press simultaneously take en masse flights to seek refuge via 21st Century Information Highways, obituaries have assumed larger than life proportions. News publishers currently offer bereaved loved ones the option to purchase e-obituaries featured by specialty ’boutique’ niche sites. Besides that, Cyberspace provides at least two more ideal experimentation platforms for news publications that integrate multimedia content and obituary blogs. A prime exemplar is Obit Magazine, which is a virtual domain that deals exclusively with everything and anything that may pertain to death and posthumous tribute. First launched in 2007, the site has reportedly gained phenomenal popularity fueled by over 30 journalists who keep it going and growing by leaps and bounds with each passing nanosecond that goes around.